I am Manouchehr Kia, immigrated to New Zealand in 2004. I am Persian (Iranian), people call me Manou - Prince of Persia. I graduated with Diploma in International Travel and Tourism from the Wellington Institute of Technology. I've started my first business in Wellington and bought a café 'The Coffee Club'. In about two years I sold it and moved to New Plymouth where I opened Manou’s café & restaurant. I am 6 years in food industry and I am 4 years in Manou’s café & restaurant. "A waterfront dining opportunity, Manou’s Cafe & Restaurant prides itself on being a prime spot for watching ships and boats of all sizes as well as marine and animal life off the coast of Taranaki. 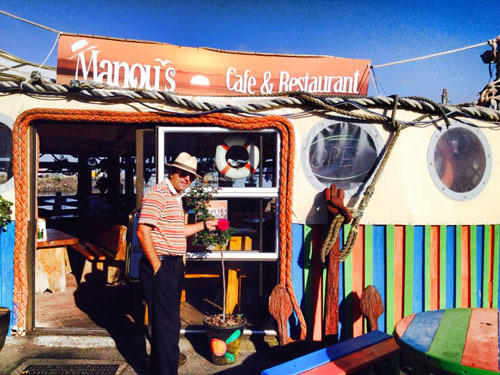 There’s no surprises, then, that Manou’s made our list for its fantastic fresh seafood, with scallops, prawns and grilled fish being particular favourites with our members.